It may surprise no one the Rio Grande Valley is home to a native parrot species. What may astound you, though, is to find one in your yard. They’re going to come to fruiting trees. When acorns are in season in the fall, they’ll really hit those. If you have a platform bird feeder, you might get parrots coming to your platform bird feeder for sunflower seeds. They really like dead palm trees. The kind that there’s just a trunk standing, there’re no more green fronds, and it’s very brittle. The golden fronted woodpecker comes in and excavates a cavity and uses it to raise a family; well the next year, a parrot might use it. A parrot can’t really excavate like a woodpecker, but he says, hey, I just need to make this a little bigger, and I’ll use it. If you live in the RGV and have a dead or dying palm in your yard (that doesn’t pose a safety threat), leave it for the birds. It’s good for them and nature tourism. Brownsville, Harlingen, Weslaco and McAllen—all have city ordinances where you cannot mess with the birds. And one reason is the nature tourists from all over the world come to the valley to see several unique birds, and the red-crowned parrot is usually near the top of the list. Learn more about Texas birding opportunities on the Texas Parks and Wildlife website. 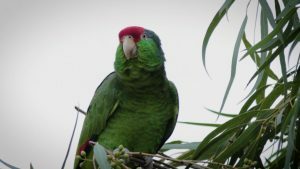 This entry was posted on Thursday, June 28th, 2018 at 12:00 am	and is filed under Birding, Red-Crowned Parrot. You can follow any responses to this entry through the RSS 2.0 feed. You can skip to the end and leave a response. Pinging is currently not allowed.